What’s It About? 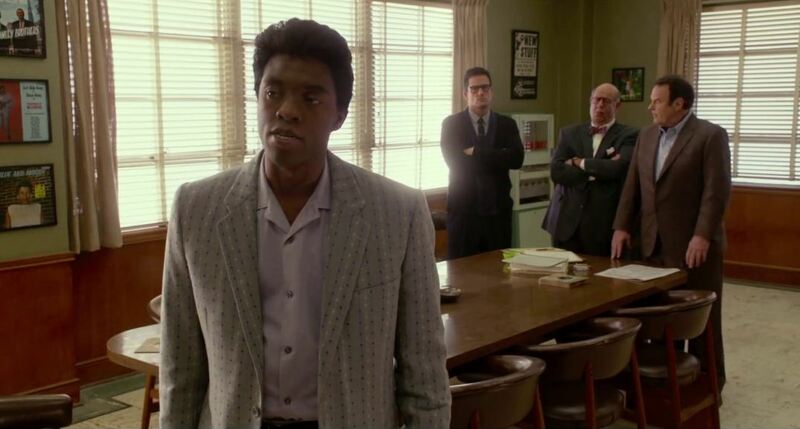 Director Tate Taylor (The Help, Winter’s Bone) shines a light on James Brown (Chadwick Boseman), the hardest worker in showbiz, a worthy accolade considering the star’s 94 US-charting hit singles over a career spanning half a century. Tracing the musician’s destitute upbringing in South Carolina, trouble with the law to pioneering a new genre of music, Get On Up has a task to fulfill, entirely appropriate for a biopic on the Godfather of Soul. Verdict? Fro m the outset, Get On Up is troubled with finding an introduction for the charismatic singer, settling on a fraudulent interpretation of James Brown’s notorious arrest, depicting the star blasting shotgun shells for misuse of his personal toilet. Mere fabrication of actual events, perhaps, but the scene serves the purpose for resurrecting the wild-eyed, untamed persona of Mr Brown. 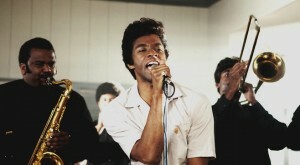 Running chronologically, the biopic uses a series of flashbacks to tell the story and writer Jez Butterworth (Edge of Tomorrow) focuses on the King of Funk’s early struggle. When a turbulent love causes parental division, Brown’s mother heartbreakingly flees the family home, destined for a life of prostitution. The father (Lennie James), rears his kid, violently, before unashamedly dumping his son at a local brothel. Director Taylor injects a sympathy to Brown’s tough, character-defining early years, causing murmurs within the audience as the youngster is jailed for stealing a suit. Yet it’s this very incarceration where Brown capitalises on his musical gift, attaining a lead spot in rhythm and blues vocal group The Famous Flames. Chadwick Boseman (42, Draft Day) effortlessly captures the energetic, raw talent of Brown in a performance that will deservedly gain consideration in award season. Via Boseman, Brown’s ambition burns bright as he drives the band forward using avant-garde dance moves to accompany a unique, rhythmic rasp. As Brown garners recognition for musical talent and transforms his record label’s old fashioned marketing thinking, Get On Up touches on his political weight as an influential African-American during the civil rights’ movement. Boseman proves himself a genuine powerhouse, revelling in James Brown’s enduring spirit and aura. But Get On Up ultimately fails the actor with a script intent on showcasing too many songs, in full. Perhaps fulfilling song quota was legal necessity for securing music rights – but be it Butterworth’s choice or music rights, the film suffers, soundtrack proving distracting and cumbersome to the overall project of unmasking Brown. Get On Up does pay its dues to the many shades of Brown’s character – abuse in his childhood, carnal desire in adult life and difficult relationships with fellow band members. Yet the film omits a scrutiny, a refusal to delve into the why, choosing instead to skirt over points of interest and flicker from anecdote to anecdote. 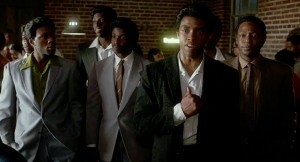 Get On Up unashamedly fabricates the past – so it’s an error the same imagination doesn’t delve into truths. Instead, just as the pulsing soundtrack swings from song to song, hazy, brief flashbacks provide ambiguous interpretations of the soul singer; womaniser, woman beater, egomaniac, substance abuser, tormented soul – who is the real Mr Brown? If one blinks, the tragic death of Brown’s son Teddy, would even fall unnoticed as the film jerks from one scene to the next. Final Words: Get On Up lives in the shadow of its protagonist – despite this, casting of the biopic is genius and Boseman’s portrayal encapsulates Brown’s charisma, magnetism and dark shades of narcissism. Get On Up is in UK cinemas on 21 November 2014.